Almost as old as the internet itself, forums have been the communities that internet users have gone to since the beginning to ask questions and connect over similar interests. These communities are truly the first type of social media that existed online, but unfortunately many social media campaigns fail to target these great resources. Often times individuals will turn to forums to ask for technical help, look for information on businesses they may use for a service or just for general knowledge of a subject. This creates great opportunities for business owners to reach out with their services or to resolve any problems that may have happened. At first look, you may think it will be hard to find specific forums that are tailored to your businesses industry. This couldn’t be further from the truth – there are many tools available that help you narrow down your search and find appropriate leads to chase. 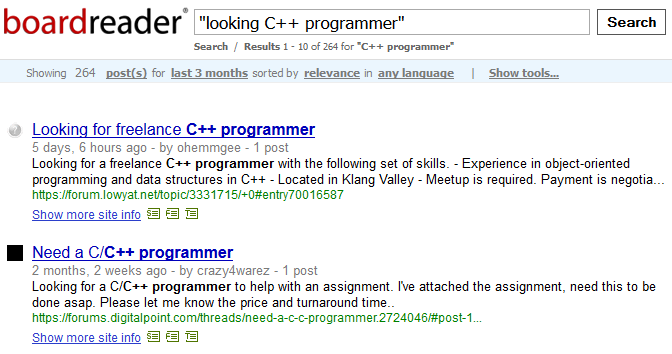 Another important use of forum searching is being able to effectively find mentions of your own company. 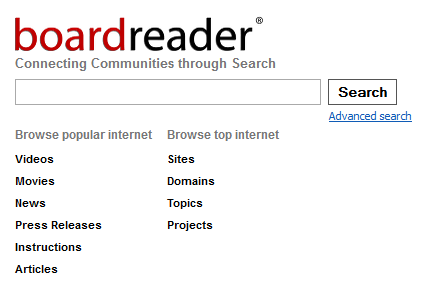 Many people use forums to communicate their problems with other users as well as look for new suggestions as well. To look for mentions of your own company, it is often best to use Google to search the web for your name. 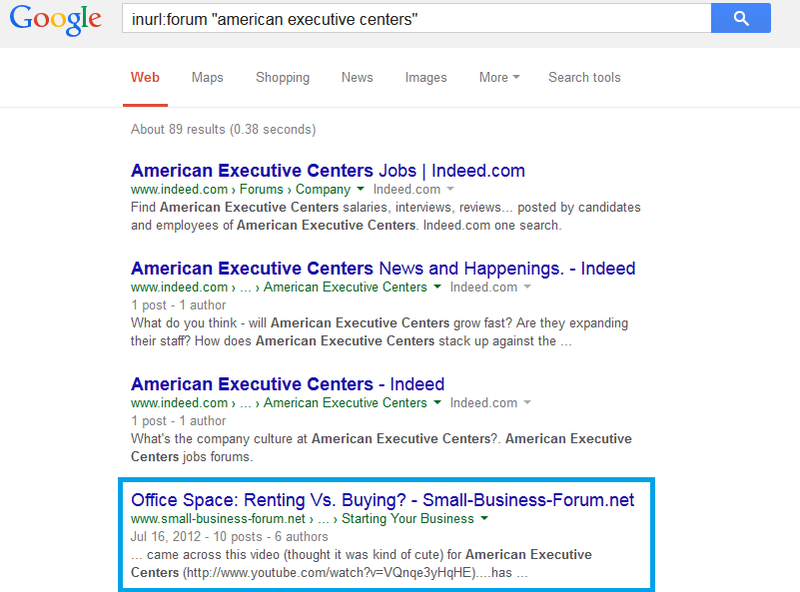 As illustrated above, a query has been executed that will be searching for forums (the URL is required to have forum in it) that mention the business name American Executive Centers. The fourth search result is related to an individual who is struggling to decide whether they should rent or buy an office space, and the business name has also been mentioned. Great potential lead? I think so! So a few years ago, my friends and I started up an online business, and, for the most part, it has been moderately successful. Although right now, it is just the three of us working from out of my home; we have begun the process of taking on more employees and are now seeking to expand our operation. In the next few months, we should have around 8-10 employees working for us, and since we obviously will not be able to accommodate them in my home, we also have begun to search for new office space. So my question to you guys: Would we be better off Renting or Buying office space? We are located in the Greater Philadelphia area, and after a little searching, I came across this video (thought it was kind of cute) for American Executive Centers (http://www.youtube.com/watch?v=VQnqe3yHqHE)….has anyone ever heard of them/know if they would be a good fit for my business? Thanks for the help everybody. If you owned American Executive Centers, this would be a great opportunity for you to reach out and answer any questions this person may have. What makes this technique so great is that you have numerous options to directly connect with them. You can either reply directly in the thread so that the public can see your answers, you could message them directly to give a more personal feel or you could even attempt to Google their username in hopes of turning up an email address or phone number. Not only can you search forums for mentions of your own company, but you can also search for mentions of your competition in hopes that you can dig up a lead that is unsatisfied with their current situation. With a simple Google query for one of American Executive Center’s local competitors we are able to find mentions of Intelligent Office in forums and pick out the people that are unhappy with them. Then, we can reach out and pitch American Executive Centers’ benefits and how much better a switch would be for the individual.